The Korg Poly800 and its rackmount / tabletop cousin the EX800 are odd beasts. They came from that strange era of Korg synths where they couldn't seem to decide between analogue and digital, and so came up with a selection of hybrid synths that didn't seem to excel as either sound. 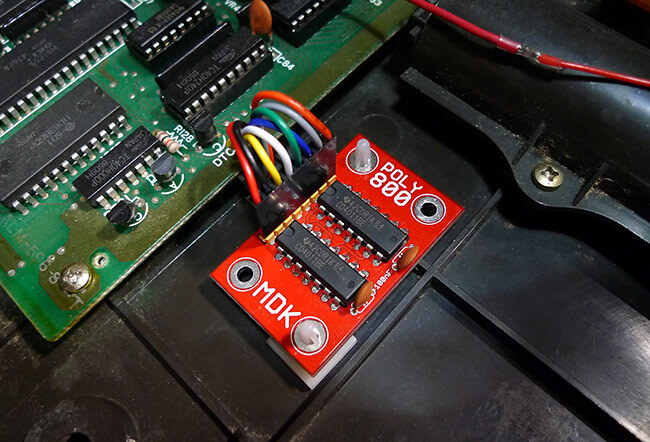 On paper the Poly800 was a pretty well endowed machine but in reality it always sounded a little thin and never really fulfilled its potential, which is where we step in with our Polybeast mods! The mods consist of 3 main sections, Filter mods, FM mods and audio mods. 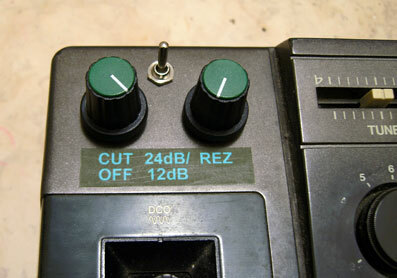 Cutoff & Resonance Knobs: This mod can be found around the net under several different names and versions but essentially it adds knob controls for the filter cutoff and resonance parameters for realtime control. The resonance knob can take the resonance well into self oscillation and far beyond what is programmable from the front panel. This can produce the kind of screaming top end and subsonic bass that gives these machines a whole new range of sonic possibilities. The filter cutoff knob allows you to perform long filter sweeps for those squidgy burbling analogue lines that you knew your Korg was capable of but could never actually program. Both parameters are still also controlled by the normal programming methods which can set the range of the knobs control. VCF CV input: This socket round the back of the machine adds an external 0-5v control voltage input that controls the filter cutoff. The new filter cutoff control knob is disabled when a jack is plugged into the socket. External Audio Input: This accepts a line level audio signal and inserts it before the filter and chorus effect so you can use it to process external signals. The input is set up so that a loud signal will slightly overdrive the filter for a dirty sound. External Audio Path Switch: This switch sends the audio from the external input either via the DCO1 or DCO2 signal path or turns it off completely. The input doesn't respond to the DEG audio level envelopes but instead is gated on and off by the noise gate that korg implemented to silence the synth when all the envelopes are completely closed. i.e. when the DEG envelope for the chosen path closes completely at the end of the release phase, the noise gate is activated and the external audio input is cut. The audio input is still effected by the filter envelope. An external input can easily be filtered without having to hold down a note by setting up a patch with all the oscillator tones turned off, but the DCO 'level' parameter set to full. If you use the note 'Hold' function and press a key the audio input will be audible and can be processed with the filter etc. 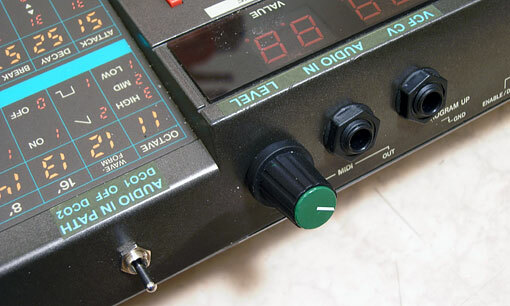 Input Level Knob: Its a knob that controls the level of the audio input. What more can we say? 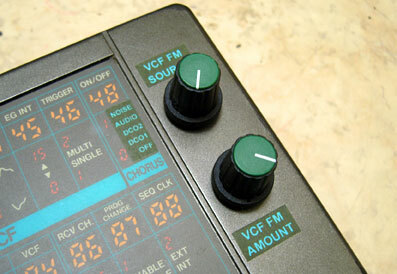 These consist of a source selection knob and an FM amount knob. Essentially VCF FM allows you to modulate the filter cutoff at audio frequencies to create all kinds of clanging cross modulation and bizarre alien splatters & sweeps. This effect works best with the resonance cranked up into self oscillation which is where the new resonance knob mod comes into its own. The source selection knob allows you to select one of four sources for the FM signal. These are DCO1, DCO2, Noise and audio input. The audio input takes its signal from before the input level knob so you can use the audio to modulate the filter cutoff but remove the actual audio signal from the mix. The source knob also has an off setting. 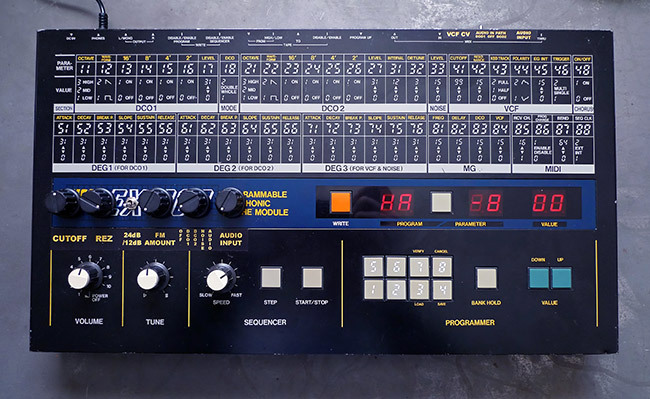 The EX800 version features exactly the same mods as the Poly800 and can produce exactly the same effects as for any real purposes it is exactly the same machine internally. With the first method the Audio Input socket, the VCF CV input and the External Audio Path switch are mounted on the rear of the case. With the second the Audio Level knob is also placed on the rear. Its entirely up to you which arrangement you want to go for. We'd suggest that the first version balances better in terms of the knob positioning and layout, but the second keeps the panel graphics intact. Both layouts are exactly the same in function. See below for mp3 demos of these mods from both a Poly800 and an EX800. We have not yet tried this mod with an EX800, but we can't think of any reason why it wouldn't work fine. 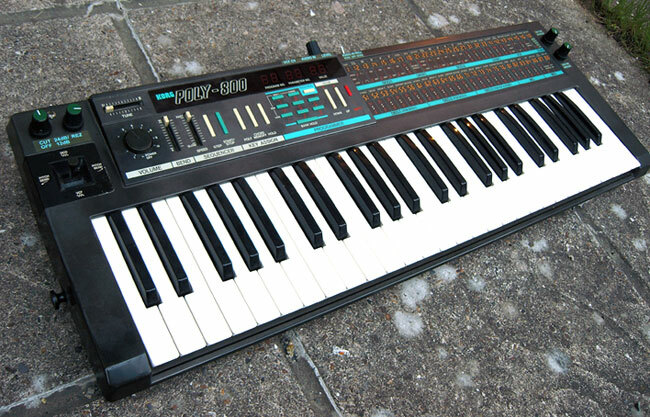 The Korg Poly800 MDK was an upgrade kit for the Poly800 mkI that Korg released for what seems like about 20 minutes in the late 80's. What is does is allow you to load and dump the entire patch memory to and from your synth and your computer via midi system exclusive (sysex) data exchange. The original Poly800 mkI's only allowed you to save and load sounds from cassette, like on early home computers, although WAV or mp3 recordings of the audio data played from your computer also work once you've figured out the correct levels. The EX800 already has this ability. 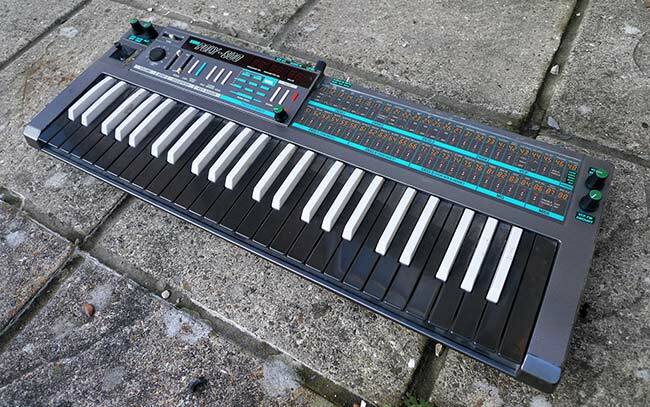 Tthe fact it has no keyboard and so therefore didn't need the keyboard scanning routines in the operating system, gave Korg some extra space to add the facility for sysex transfer. We also sell a DIY kit for this mod. Instructions for using MidiOX to load and save sound banks can be found at the end of the DIY build guide HERE. If your machine has a backup battery but it still loses its memory the chances are that the battery is well beyond its reasonable lifespan and is completely dead. For £10 we can replace the backup battery in a battery holder that allows for easy replacement in the future. if it has never been replaced then it could possibly be corroding the circuitboard with leaking acid by now so we would recommened getting it done. If the Poly still holds its memory but you want the battery replaced as a precautionary measure, please make sure you backup any program data before shipping the synth, as it may be lost in the inevitable 10 seconds when the unit is without a battery during the switchover. 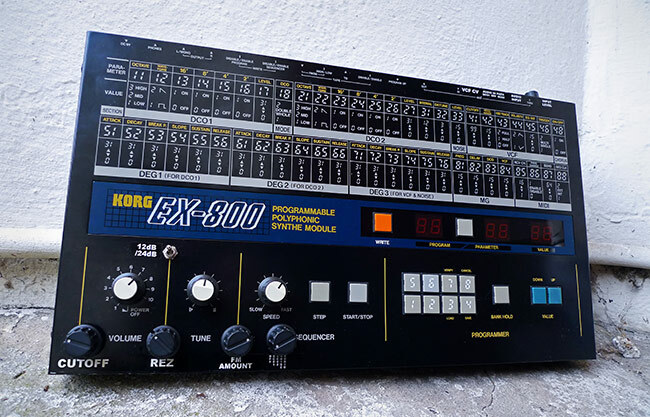 If you want your POLY800 / EX800 modded get in touch using the CONTACT form.